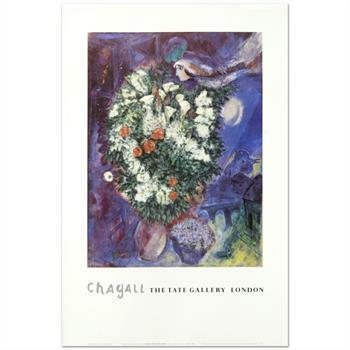 Marc Chagall (1887-1985), "Bouquet with Flying Lover" Fine Art Poster. 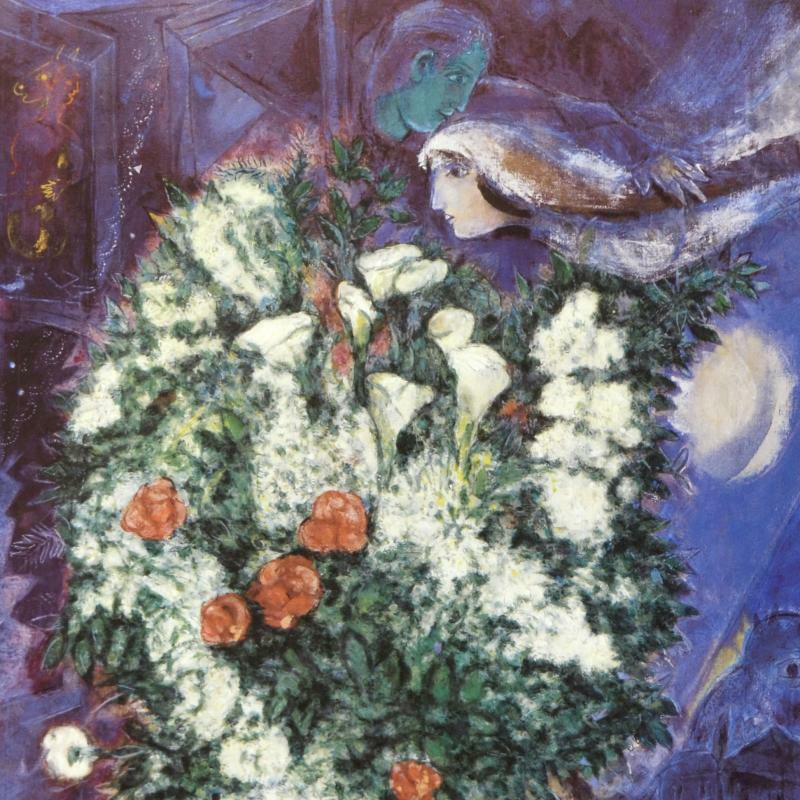 "Bouquet with Flying Lover" is a fine art poster by Marc Chagall (1887-1985)! Measures approx. 20" x 30" (with border), 15" x 24" (image). Marc Chagall (1887-1985) had a poetic, figurative style that made him one of the most popular modern artists, while his long life and varied output made him one of the most internationally recognized. While many of his peers pursued ambitious experiments that led often to abstraction, Chagall's distinction lies in his steady faith in the power of figurative art, one that he maintained despite absorbing ideas from Fauvism and Cubism. Born in Russia, Chagall moved to France in 1910 and became a prominent figure within the so-called Ecole de Paris. Later he spent time in the United States and the Middle East, travels which reaffirmed his self-image as an archetypal "wandering Jew." Marc Chagall's influence is as vast as the number of styles he assimilated to create his work. Although never completely aligning himself with any single movement, he interwove many of the visual elements of Cubism, Fauvism, Symbolism and Surrealism into his lyrically emotional aesthetic of Jewish folklore, dream-like pastorals, and Russian life. In this sense, Chagall's legacy reveals an artistic style that is both entirely his own and a rich amalgam of prevailing Modern art disciplines. Chagall is also, much like Picasso, a prime example of a modern artist who mastered multiple media, including painting in both oil and gouache, watercolor, murals, ceramics, etching, drawing, theater and costume design, and stained-glass work.